At times, crabbers become concerned due to certain actions their hermit crabs are beginning to display. Often, they are concerned that the hermit crab is ill, or has another form of complication happening that needs attention. Where, as on occasions, the symptoms they are observing may be due to a stressful situation, whether it be from their past or current living conditions, there are many times that the hermit crab is displaying premolt symptoms. If one knows that he/she has provided the hermit crab with the essentials it needs to thrive (proper humidity level, proper temperature, proper diet, bacteria/mold and a pest-free environment, etc. 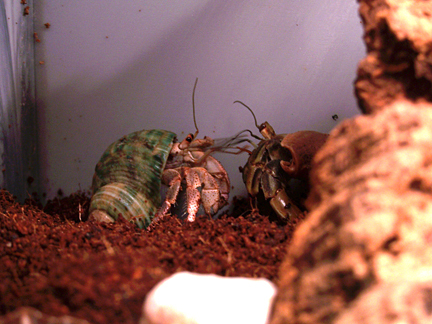 ), what you are beginning to observe may very well be premolt symptoms that the hermit crab is displaying. With the numerous molts we have had, I would like to share some of the premolt symptoms I have observed with our hermit crabs and hope it can be of some help to ease other crabbers concerns. 1. Gorging food for almost 2 weeks prior to molting. 2. A few days–up to and including almost 2 weeks prior to molting–consuming no food at all. 3. Very restless behavior during the daylight and evening hours, including attempting to climb the glass walls inside of the crabitat as though they are looking for a way out. 4. Dragging their large cheliped almost under them as though it is too heavy to hold up, or in front of them as opposed to being slightly in front of them when they are scooting. 5. The V shaped eye stalks _/ as opposed to the typical parallel eye stalk shape. |_| The pupil of the eye stalk looks as though they are looking outward as opposed to straight ahead. 7. 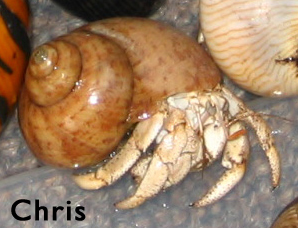 The leg tips of the hermit crab turn lighter in color, along with a lighter whitish/beige coloring at the joints of the legs and the chelipeds. With some, the outer parts of the legs change to a whitish/beige in color with the very center of the legs and chelipeds having a darker coloring to them. 8. Along with the lighter coloring of the hermit crab’s exoskeleton, if one looks closely where the joints meet, you can at times see where the old exoskeleton is pulling away from the new body. 9. When the hermit crab is scooting through the sand in the crabitat, its shell leaves a deep groove type impression in the sand. 11. When the hermit crab is picked up and it first comes partly out of its shell, one of its front legs stick straight out as though it has no control of it. Within a few seconds, the leg goes into a normal position like the other legs. 12. The premolter spends a lot more time than usual in, or around, the water ponds. This behavior has been observed around the ocean water pond as well as the fresh water pond. 13. Some of the hermit crabs get an odor to them. This odor reminds me of the silicone that is put around a tub/shower. Some crabbers have related this odor to iodine, or butterscotch. 14. The hermit crab will attempt to find a secluded area away from its tank mates. Many will go into single hidey areas we have within our crabitats. 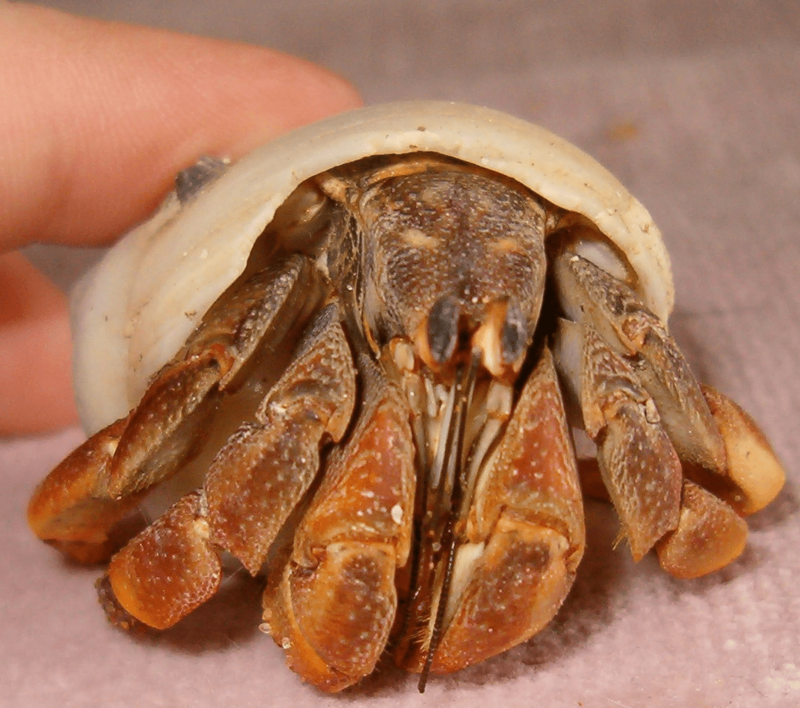 Smaller hermit crabs have gone into larger extra shells–in their own shells– where they can hide. This reminds me of a shell plug within the larger shell opening. 15. 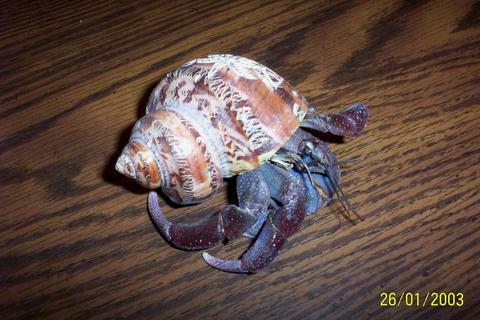 The hermit crab has slow antenna movement and appears lethargic, or depressed. Unless they are picked up and moved, they remain in the same place they were put. 16. A behavior change is noted. A very shy, out-going hermit crab appears shy, or withdrawn. It is scooting about the tank most of the day as if in search of something. It becomes slightly or overly crabby with its tank mates. I have one hermit crab that never digs, but when in premolt she will begin to burrow. 17. The hermit crab appears to suddenly become uncomfortable with the shell it is wearing. It begins to change shells frequently, but just cannot seem to find that right fit regardless of what shell it has on. This behavior is more frequent than a normal hermit crab trying shells on for fun or entertainment. 18. The hermit crab will begin to dampen or wet the sand regardless of how perfect the humidity level is at the time. 19. The hermit crab will begin to remain about half way out of its shell when it is relaxing, as opposed to being mostly within its shell. 20. The hermit crab will have whitish, cloudy or hazy looking eyes. I have also observed the pupils of the eyes being a dull reddish brown in color as opposed to being the bright, shiny, almost black color. 23. If the hermit crab is missing a leg or cheliped, a gel limb will form. The gel limb appears to go through a sudden growth spurt the closer the hermit crab is to actually molting.